Onigirazu is a new type of Onigiri (rice ball) becoming very popular in Japan recently in 2015. 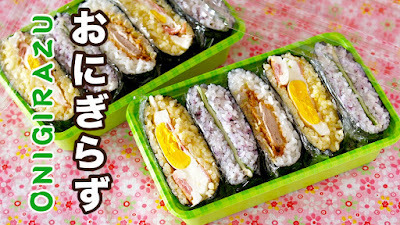 Unlike Onigiri (rice ball), Onigirazu can be prepared quickly without making into a triangular or a ball shape but just by wrapping rice and the fillings in Nori seaweed sheet. I think it is a great idea that you can wrap more fillings than the regular ball-shaped Onigiri. Also, it looks very pretty like sandwiches!!! 1. Place Nori seaweed sheet on plastic wrap. 2. Place rice in the center, then flatten it out. 3. Place the fillings on top. 4. Cover the fillings with rice, then flatten it out. 5. Fold the corners towards the center of the rice, then wrap tightly with plastic wrap. 6. When the Nori gets soft, cut into half.